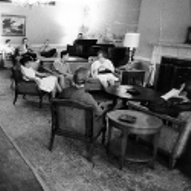 In the late 1940s, seven psychiatric patients at Rockland Psychiatric Center in New York State formed a self-help group that met in a hospital “club room”. They formed this group to prepare themselves to be discharged and cope with the challenges of finding shelter and work and dealing with relationships and inevitable relapses. 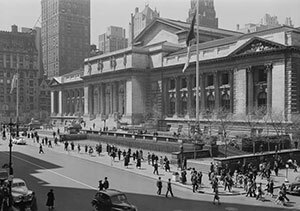 Soon after leaving the hospital, they began to meet on the steps of the New York City Public Library to re-create the “club room” experience, believing that it would sustain their recovery, provide a mutual support system and ultimately lead to changing society’s perception of people living with mental illness. They called their support group “WANA” (We Are Not Alone). In 1948,with the help of two wealthy volunteers, Elizabeth Schermerhorm and Hetty Richard, and a donation from the National Council of Jewish Women, a building on West 47th Street in New York City was purchased as a “clubhouse” for WANA. Because it had a small fountain in the backyard, WANA named their new building “Fountain House”. Fountain House, initially staffed and operated solely by ex-psychiatric patients and volunteers, was designed to provide social supports and serve as meeting place for ex-psychiatric patients. People who joined Fountain House were called members rather than patients and could remain members for as long as they wished. As Fountain House grew, the members decided to hire professional non-consumer staff to operate the program. In 1955, the first professional, non-consumer mental health staff were recruited. Even with the addition of professionally trained staff, Fountain House continued to maintain its clubhouse atmosphere and philosophy — informed by the leadership and ideals of ex-psychiatric patients. After trying out several directors to unsatisfactory results a social worker named John Beard was hired (Pratt, Gill, Bartlett, & Roberts, 2006). Before he was hired, Beard held unconventional ideas for his time about rehabilitating people suffering from serious mental illness. Beard’s approach, though unconventional to the medical establishment of the time, was a perfect fit for Fountain House. It energized its members and gave the clubhouse direction. Beard turned Fountain House from what was essentially a social club into a truly comprehensive psychiatric rehabilitation facility — setting the foundation for the model of the Clubhouse Movement (Beard, Propst, & Malamud, 1982). Beard blocked a movement within the membership for a hierarchy amongst members, whereby some would have decision-making power over others. He instilled the following principles of equality into the Clubhouse Movement: admitting all persons living with a mental illness to membership; and all members having equal opportunities and an equal say in how things are run within their clubhouse. 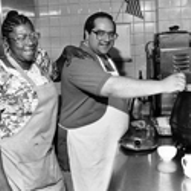 In 1980, Rudyard Propst was hired as the Director of Education and Training at Fountain House. During his tenure he fully integrated members into staff training programs (Glickman, ca. 2013). This change and Propst’s influence paved the way for the full integration of members in the drafting and decision-making process that formed the International Standards for Clubhouses Programs in 1989. Since then, international members and staff have shared decision-making power for amendments to the Standards. Current Standards can be viewed here. John Beard and Rudyard Propst were prominent early pioneers and visionaries of the clubhouse movement. They had what might be called an obsession with forming a clubhouse community that would be based on radical equality (Vorspan, 2005). They pressed the growing clubhouse movement, against resistance at times, to uphold an unequivocal equality between members and between staff and members. Beard once said that the future of clubhouses depended on whether members would be allowed to share crucial functions [with staff] and not just routine ones (Glickman, ca. 2013). The Fountain House program formed the template for what became the evidence-based Clubhouse Model of Psychosocial Rehabilitation and Recovery. Today there are over 320 local Clubhouses around the world. The International Clubhouse Movement is currently governed by Clubhouse International (formerly called the International Center for Clubhouse Development [ICCD]). True to its formative values, members, people living with mental illness, hold significant positions in it. Adkins, V., & Lenyoun, M. (2004, Summer). An Active Treatment Alternative: A Clubhouse Model. The Journal of Cognitive Rehabilitation, 22-26. Beard, J. H., Propst, R. N., & Malamud, T. J. (1982). The Fountain House model of psychiatric rehabilitation. Psychosocial Rehabilitation Journal, 5(1), 47-53. Glickman, M. (ca. 2014). Integration: Its Evolution in the History of the Clubhouse Movement. Pratt, C. W., Gill, K. J., Barrett, N. M., & Roberts, M. M. (2006). Psychiatric Rehabilitation. Elsevier. Vorspan, R. (2005). What Makes Clubhouse Communities True Clubhouse Communities?.